based on a 70 kg "reference man"
Bowen, H. J. M. Environmental Chemistry of the Elements. London: Academic Press, Inc., 1979. Cardarelli, François. Materials Handbook: A Concise Desktop Reference, 2nd edition. London: Springer–Verlag, 2008. Chi, T. C. "Electrical Resistivity of Alkaline Earth Elements." Journal of Physical and Chemical Reference Data, volume 8, number 2, 1979, pp. 439–498. Cohen, E. Richard, David R. Lide, and George L. Trigg, editors. AlP Physics Desk Reference, 3rd edition. New York: Springer-Verlag New York, Inc., 2003. Cox, P. A. The Elements: Their Origin, Abundance and Distribution. Oxford: Oxford University Press, 1989.
de Podesta, Michael. Understanding the Properties of Matter, 2nd edition. London: Taylor & Francis, 2002. Dronskowski, Richard. Computational Chemistry of Solid State Materials. Weinheim, Germany: WILEY-VCH Verlag GmbH & Co. KGaA, 2005. Emsley, John. Nature's Building Blocks: An A-Z Guide to the Elements. Oxford: Oxford University Press, 2003. Emsley, John. The Elements, 3rd edition. Oxford: Oxford University Press, 1998. Firestone, Richard B. 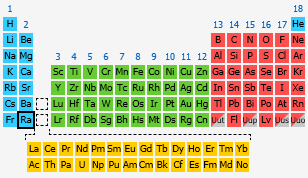 Table of Isotopes, 8th edition, volume 2. Edited by Virginia S. Shirley, with assistant editors Coral M. Baglin, S. Y. Frank Chu, and Jean Zipkin. New York: John Wiley & Sons, Inc., 1996. Greenwood, N. N., and A. Earnshaw. 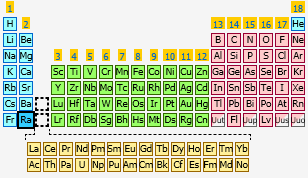 Chemistry of the Elements, 2nd edition. Oxford: Butterworth-Heinemann, 1997. Gwyn Williams. Electron Binding Energies. http://www.jlab.org/~gwyn/ebindene.html . Accessed on April 30, 2010. Ho, C. Y., R. W. Powell, and P. E. Liley. "Thermal Conductivity of the Elements: A Comprehensive Review." Journal of Physical and Chemical Reference Data, volume 3, supplement 1, 1974, pp. I–1 to I–796. Huheey, James E., Ellen A. Keiter, and Richard L Keiter. Inorganic Chemistry: Principles of Structure and Reactivity, 4th edition. New York: HarperCollins College Publishers, 1993. Kittel, Charles. Introduction to Solid State Physics, 8th edition. Hoboken, NJ: John Wiley & Sons, Inc, 2005. Liboff, Richard L. Introductory Quantum Mechanics, 3rd edition. Reading, MA: Addison Wesley Longman, Inc., 1998. Lide, David R., editor. CRC Handbook of Chemistry and Physics, 88th edition. Boca Raton, Florida: Taylor & Francis Group, 2008. Marshall, James L. Discovery of the Elements: A Search for the Fundamental Principles of the Universe, 2nd edition. Boston, MA: Pearson Custom Publishing, 2002. Nobel Foundation. Marie Curie: The Nobel Prize in Chemistry 1911. http://nobelprize.org/nobel_prizes/chemistry/laureates/1911/marie-curie-bio.html . Accessed on July 15, 2009. Nobel Foundation. Marie Curie: The Nobel Prize in Physics 1903. http://nobelprize.org/nobel_prizes/physics/laureates/1903/marie-curie-bio.html . Accessed on July 15, 2009. Nobel Foundation. Pierre Curie: The Nobel Prize in Physics 1903. http://nobelprize.org/nobel_prizes/physics/laureates/1903/pierre-curie-bio.html . Accessed on July 15, 2009. Oxtoby, David W., H. P. Gillis, and Alan Campion. Principles of Modern Chemistry, 6th edition. Belmont, CA: Thomson Brooks/Cole, 2008. Pauling, Linus. The Nature of the Chemical Bond, 3rd edition. Ithaca, NY: Cornell University Press, 1960. Quadbeck-Seeger, Hans-Jürgen. World of the Elements: Elements of the World. Translated by José Oliveira. Bad Dürkheim, Germany: Wiley-VCH Verlag GmbH & Co. KGaA, 2007. Rohrer, Gregory S. Structure and Bonding in Crystalline Materials. Cambridge: Cambridge University Press, 2001. Silbey, Robert J., Robert A. Alberty, and Moungi G. Bawendi. Physical Chemistry, 4th edition. Hoboken, NJ: John Wiley & Sons, Inc., 2005. Vainshtein, Boris K., Vladimir M. Fridkin, and Vladimir L. Indenbom. Structure of Crystals, 2nd edition. Modern Crystallography 2. Edited by Boris K. Vainshtein, A. A. Chernov, and L. A. Shuvalov. Berlin: Springer-Verlag, 1995. Weeks, Mary Elvira, and Henry M. Leicester. Discovery of the Elements, 7th edition. Easton, PA: Journal of Chemical Education, 1968. Yaws, Carl L. "Liquid Density of the Elements." Chemical Engineering, volume 114, number 12, 2007, pp. 44–46. Yaws, Carl L. The Yaws Handbook of Physical Properties for Hydrocarbons and Chemicals. Houston, TX: Gulf Publishing Company, 2005.